Rocket Italian Review - Is it any good? 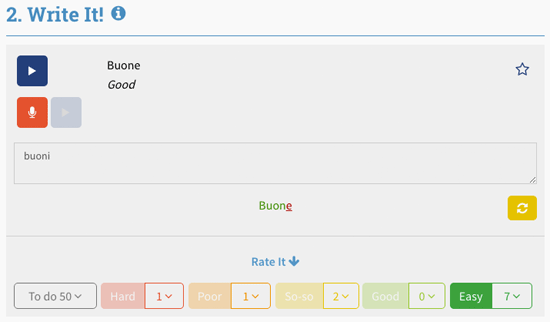 Note: I received a free copy of Rocket Italian to help me write this review. Some links in this review might be affiliate programs, so I'll make some coffee money if you buy. You get it at the normal price though! Rocket Italian is an online Italian course made by Rocket Languages. You'll see a lot of people talking about it, because it appears to be an excessively good buy compared to some of the other big language software. Rocket Italian hasn't been around as long as these big guys, but it does seem to be giving them a run for their money. PC Mag named it "Editor's Choice", beating Rosetta Stone, Pimsleur, Fluenz, Duolingo, Transparent and a bunch of other tools to the top spot. So what do you get, and more importantly — does it even work? I really love the idea of learning a language through an audio course. I could plug it into my car stereo and learn a language while stuck in traffic, rather than just listening to my playlist of 90s pop rock. But... most of the time they are deathly boring. I know that repetition is important, but not falling asleep at the wheel is also important. 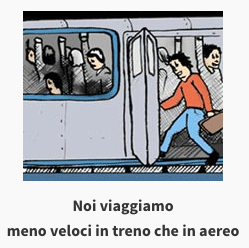 This is the first reason why I love the Rocket Italian interactive audio lessons. They are not boring. Rocket Italian interactive audio lesson. 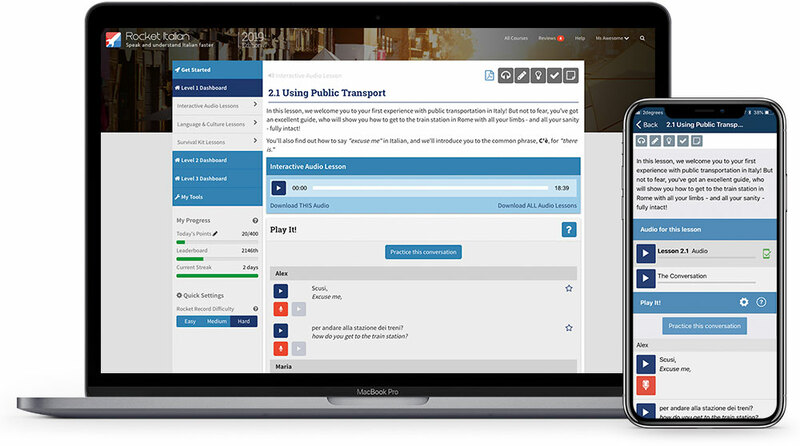 You can play it on screen, or download all the lessons to your computer or phone/tablet. Each lesson is around 25 minutes long, which is the perfect length for me to learn a bit of Italian on my workday commute. They are hosted by Maria (native Italian speaker) and Alex (Italian-American), and even though their banter is clearly scripted and their jokes are occasionally corny, I would much rather have that than the personality-free robot dude that Pimsleur dishes up. Alex and Maria are definitely not robots. They're friendly and human and a little bit silly, and together they do an excellent job of very gently introducing you a genuinely surprising amount of important grammar and vocabulary. The lessons are built around a conversation, which (in typical language-course tradition) starts out with introductions and greetings, and progresses to booking a hotel room. Once those staples are out of the way, the conversations get more creative and interesting. At one point Alex has confidence issues trying to ask a pretty lady on a date! But the actual conversations aren't what you're really learning: You're learning how Italian works. Alex and Maria break down each conversation and explain all the little pieces, and give you other ways you could use those little pieces, so you actually end up with a good working knowledge of basic Italian. I would go so far as to say that if you're heading on vacation and you need a crash course in Italian, the interactive audio lessons might be all you need to get by. One important note: You're strongly encouraged to participate in the lessons by speaking out loud after the hosts. It's tempting to just “say it in your head”, but that's not nearly as effective. This is why it's so great to do it in the car. I also like to put on a lesson when I'm cooking dinner. There's something very amusing about shouting in Italian while peeling potatoes. If you're after real fluency and a deeper understanding of the material covered in the audio course... you'll be digging into these lessons. They're essentially grammar and vocabulary lessons that go into more detail than the audio course. These 33 lessons aren't audio lessons in the sense that you can download them to your phone and listen to them in the car, but they do include a lot of audio so you can train your ear and practice your pronunciation. ‍Handy hint: Unlike a lot of other courses that force you to complete levels before you can move on, Rocket Italian lets you hop around the lessons in any order you like. If you're in a hurry, you might find it tempting to skip the Interactive Audio courses and just binge the Language and Culture lessons instead. But I found that doing the Interactive Audio lessons alongside these Language and Culture lessons was more effective. The Interactive Audio lessons gently and casually exposed me to a variety of grammar points. Then, when I met those grammar points in the Language and Culture lessons, I was like, "Oh, so THAT'S how you work..."
It made it much easier to digest and remember. The language and culture lessons tie into the interactive audio course and give you more detail. There is built-in audio and pronunciation practice for every Italian sentence. This is where Rocket Italian really helps you "get it right". If you're anything like me, your natural inclination might be to go through the material once or twice, feel like you understand it, and then move onto the next lesson. But the problem is, you don't actually know it back to front. And that's why you get nervous using your Italian on an Italian speaker, and why it's so easy to "go blank" when you're under pressure. So Rocket Italian gives you a lot of tools to help make sure you really know the material. Write it: You'll hear a word or phrase, and you need to write it correctly. Rocket Italian will highlight any mistakes you might make. You can also check your pronunciation (see below for how that works). I found these tests to be really good at locking that material into my brain and helping me to pull it out again when I need it. It makes me a lot more confident and relaxed. One of the big problems I had when I visited Italy was pronunciation. I knew the words... but when I said them, nobody understood me. That's the problem when you're studying alone: it's hard to tell how good (or bad) your pronunciation is. You'll find this handy little Rocket Record utility on practically every audio example throughout the Rocket Italian course. It lets you record your own voice and uses voice recognition technology to say if an Italian speaker would understand you. Rocket Record tells uses voice recognition to let you know you're pronouncing it right. The voice recognition is similar to the technology on your smartphone that lets you make voice commands. I really like this because I figure that if the voice recognition can understand me, then a real Italian speaker will definitely understand me! If you want to give this a try, you can play with the example on the Rocket Italian website. It's about halfway down the page. Who is Rocket Italian suitable for? Anyone who wants to become fluent in Italian: The availability of advanced courses means that Rocket Italian can take you the whole way. Anyone who wants a fun and easy overview: Whether it's to help out on vacation, or just for enjoyment... the interactive audio lessons in Rocket Italian are absolutely perfect for that. You can learn Italian in the car, at the gym, walking the dog. Imagine being able to speak Italian to your dog! Anyone taking a class in Italian who needs a study aid: The "language and culture" lessons are similar to a traditional classroom Italian course, so would be good to use alongside a classroom course. The built-in audio and testing features would be particularly helpful. It gets you understanding and speaking Italian quickly. If you're traveling to Italy and all you manage to get through are the interactive audio lessons, you'll probably be doing pretty well compared to the average phrasebook-toting tourist. It appeals to all learning styles. It doesn't matter if you're a visual learner or someone who learns best by listening, by reading, by completing puzzles and games... Rocket Italian has all bases covered. It's entertaining, friendly and engaging. It's been crafted with a sense of humor. Even when you're knee-deep in conjugations, there's a bit of sly wit coming through. It's not just one big gimmick. At its core is some pretty tried and true material that has formed the basis of language courses since forever. Rocket Italian gives you a new angle that makes it easier to understand and remember, but it's not trying to sell you some language-learning snake oil. It's online, so it works on Mac, PC, tablet and smartphone. There is a free app for iOS and Android that makes it easier to play lessons on your phone or tablet. No software to install. It's an online course so it all just works. You don't have to fluff around with installing stuff. Extremely reasonably priced. At the time of writing this, Rocket Italian (Premium — a.k.a level 1) was clocking in at under a hundred bucks, and gives you 29 interactive audio lessons, 33 language and culture lessons, 2240 voice comparison phrases, the full suite of testing tools, and flashcards for each lesson. That material will take you quite a long way towards fluency. If you're after bang for buck, Rocket Italian has it in spades. There is a 60-day money-back guarantee. You can try it out and if it doesn't suit your learning style, you can email their support team and they'll refund you. And because it's all online you won't have to wear any postage costs. "We travel less fast in a train than in a plane." The cartoons help you learn Italian, and they also teach you really obvious things! It's not available in stores, only through the Rocket Languages website. On the upside, this means you don't have to wait for stores to open. You can go grab it now. In my opinion, Rocket Italian could very well be the best value Italian language product on the market. There is so much learning material packed in there. 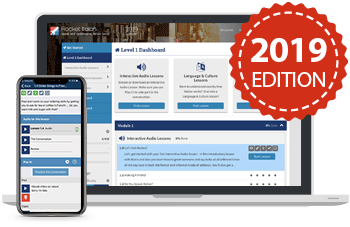 You're essentially getting three products for the price of one: The interactive audio course, the language and culture course, and all the testing tools and games. The lessons are well structured and based on a tried and true mix of grammar, vocabulary, cultural insights and silly cartoons. The testing tools make sure you know the material inside and out, so you feel really confident when faced with a real Italian speaker. Gold star for you, Rocket Italian!